Make a dinnertime favorite even quick and easier! 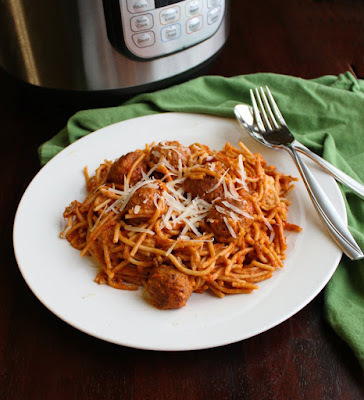 The instant pot is a great way to make creamy spaghetti and meatballs with minimal dishes and effort. 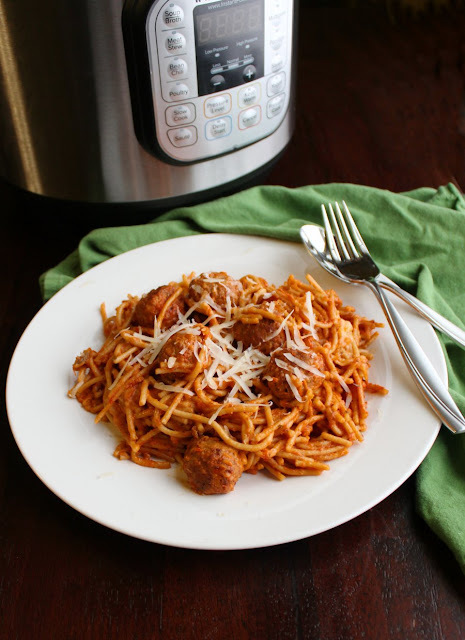 Classic spaghetti and meatballs just got even easier to make! With only one pot to clean and just a few ingredients, this creamy version is sure to become a new favorite dinner for your family. The creamy cheese filled sauce only makes it that much better! As lives get busier, it gets harder and harder to get homecooked meals on the table. That definitely doesn't mean it's not important to do though. We made it a priority when Little Dude was born that we would have dinner as a family as often as we could. That means pretty much every night unless one of us is working. It is so much more affordable to make those dinners than order them... plus you might be able to tell I kind of like making them! That doesn't mean there aren't those nights when I get home from work with no dinner planned and things start to feel hectic. So that is where the instant pot comes in handy! Previously I had a 3 quart version that was great for things like cooking frozen chicken breasts and making rice. It was also fabulous for boiling eggs or making side dishes like garlic soy green beans. But we all have healthy appetites at our house and I love having leftovers to bring to work for lunch. So it wasn't quite big enough to do full meals for us. I was really good to myself this Christmas and bought a few things I had been wanting. One of those was a 6 quart instant pot. So expect to see more one pot instant pot meals here in the coming months. I have some more ideas I'd like to try and I know I'm not the only one who can appreciate some fast and easy meal options. This recipe is great because you start with frozen meatballs. Then you just add dry spaghetti noodles (I like using the whole wheat but any would work), some water and a jar of sauce. Once that is cooked, you just stir in some cream and cheese to make it next level delicious. The residual heat melts the cheese and you are ready to go. Some warm garlic bread on the side will make everyone happy and don't be surprised if they rush for seconds! 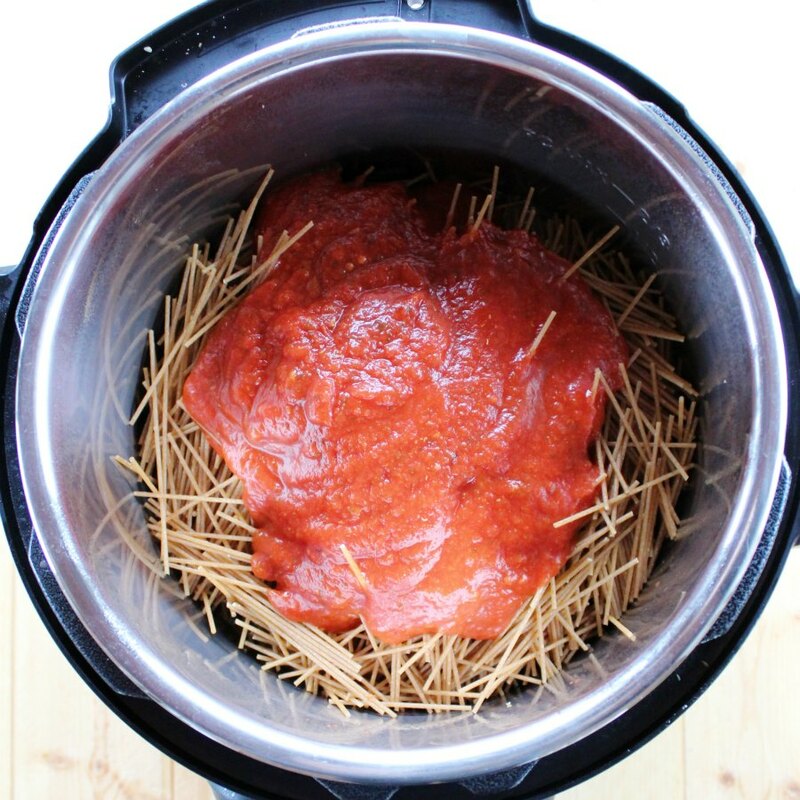 Do you have a favorite easy instant pot dinner? Or maybe you have some ideas you'd like to see made into a recipe. Either way, I'd love to hear about it! Spray the (at least 6 qt) instant pot insert with cooking spray. Place frozen meatballs in the bottom of the pot. Break spaghetti into half or thirds so it fits in the insert. Layer on top of the meatballs, alternating directions so they don't clump together. Pour water over pasta, then spaghetti sauce... do not stir. Add garlic and oregano then put lid on with the vent closed. Pressure cook for 7 minutes, then quick release the steam. Stir in the cream and Parmesan cheese then serve. Looks so easy and creamy delish! 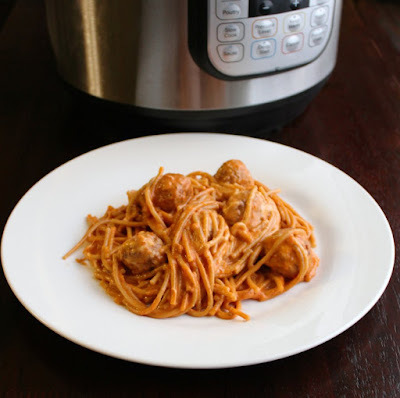 Do you know I have never used bagged frozen meatballs, always make my own, in fact made up a batch last night so I could totally use them in this recipe! Stay warm today! 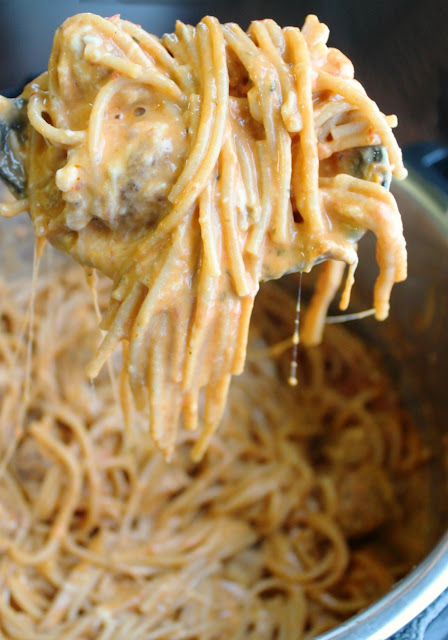 Spaghetti and meatballs is a favorite meal at our house and this looks AMAZING! Oh this makes me happy! I have the Instant Pot now, but haven't begun using it as much as I could. 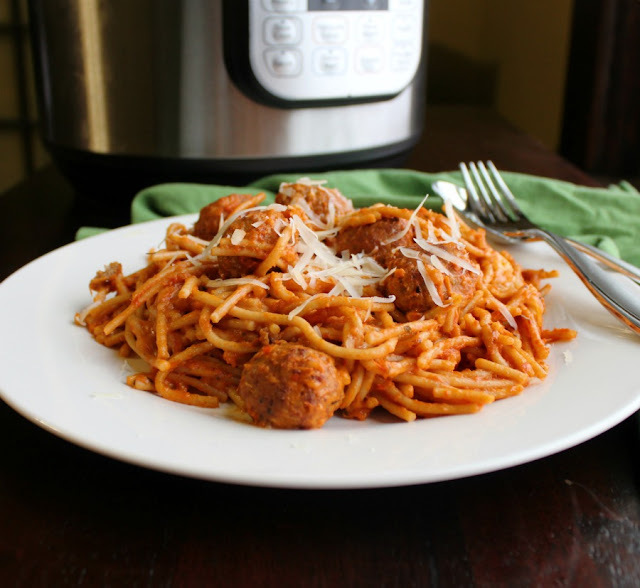 I love this idea, and will be getting some meatballs to have on hand for Spaghetti and Meatball night! 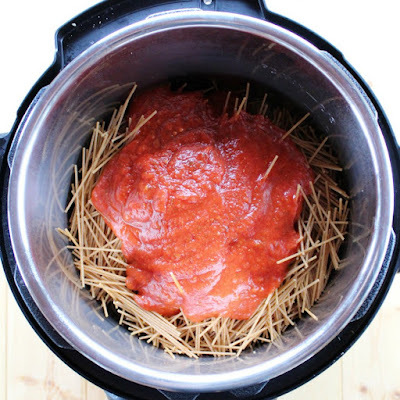 Looking forward to more Instant Pot inspiration from you! I always have homemade sauce in the freezer, and sometimes homemade meatballs in there, too. So this would be great, Carlee. I'm so glad you have dinner as a family nearly every night--it's sooo important!